Find an arbitrage opportunity in this market. Can anyone explain how to mathematically solve this exercise with for example solving a system of linear equations? i.e. 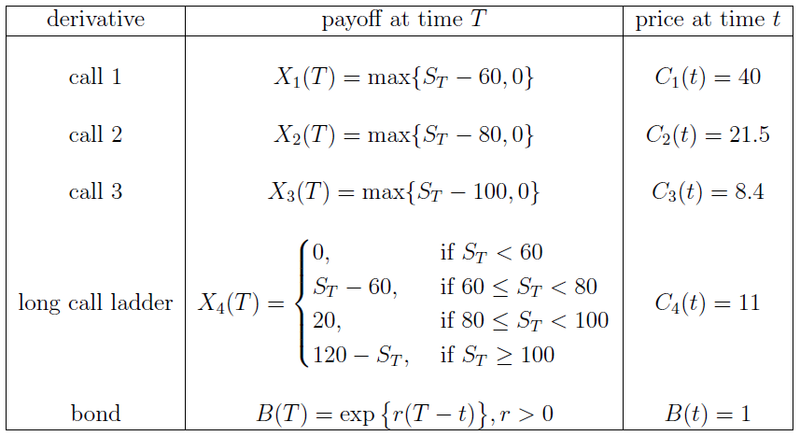 the payoff of the ladder product can be written as a linear combination of the simple payoffs. The arbitrage strategy consists on selling the call ladder for $11\$$ and buying the replicating portfolio for $10.1\$$, making a riskless profit of $0.9\$$ per contract. Not the answer you're looking for? Browse other questions tagged options portfolio-management finance arbitrage finance-mathematics or ask your own question. How to exploit calendar arbitrage? Arbitrage opportunity with call options?